Call: David on 6629 1131. 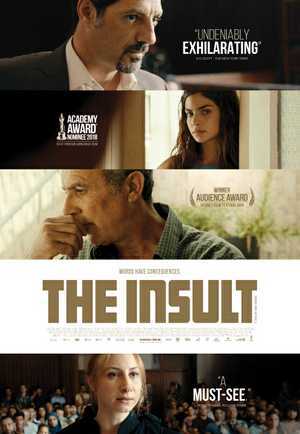 On 16 Feb Eltham Film Night will screen the Lebanese film, THE INSULT, 6pm at Eltham Hall. An Oscar Nominated legal drama. Subtitled & Rate M. Ph 6629 1131. 2018 ACADEMY AWARD NOMINEE – Best Foreign Language Film The internationally acclaimed new film from multi award-winning writer/director Ziad Doueiri, 2018 Oscar-nominee THE INSULT is a thrilling new legal drama centring on a minor disagreement between two men that escalates into a nationwide controversy. Superbly performed, this moral fable is a smart and thought-provoking piece of entertainment. English subtitles. Rated M. Enjoy the meal & movie ($25) 6pm or movie only ($10) at 7.15pm. Funds raised will be used to secure the Eltham Railway Cottage.